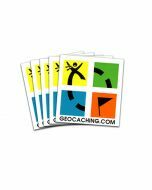 Put some Geocaching pride onto your window with this colorful 5 inch cling! Please note that these static clings may not show through darker windows. 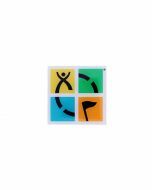 This static cling features the official Geocaching 4 color logo and is made to go on the inside of a window and show out. Just peel and attach to a clean surface! Measures approximately 5 inches by 5 inches.